Visit PrezBaROCK online at PrezBarock.com for interesting and fun items having to do with The Prez. PrezBaROCK was developed out of the desire to express the owners own political view….and do so in a way that was fun and energizing, rather than combative and often counter-productive. Save on your next purchase from PrezBarock.com with PrezBaROCK discounts, PrezBaROCK coupons, PrezBaROCK promotions and PrezBaROCK savings from 58coupons.com. 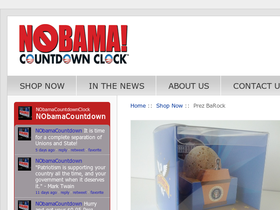 Hurry on over to Prez BaROCK to purchase a final countdown clock for only $9.95 while supplies last. Get on over to PrezBaROCK to win $1000 bailout. This is a monthly contest so make sure you enter every month. Click link for details. Pick up a Prez BaROCK for only $15 from PrezBarock.com. What a conversation starter this is. Click link to view. Pay no sales tax unless you live in WA when you purchase items from PrezBarock.com.